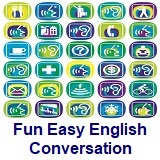 ﻿ Fun Easy English - new american english standard conversation Voice of America VOA learning English for beginners lesson 7 What Are You Doing? discourse. Lesson 7 - What Are You Doing? In this lesson Anna is starting her work at The News. She goes around the office meeting her co-workers. She learns they are all busy. In this video, learn to say the new words. 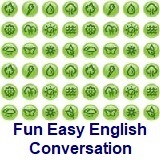 Also, learn how to use the Present Continuous tense and ask questions to clarify. 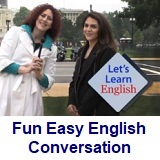 In this video, you learn about how Americans shorten verbs in the Present Continuous tense. You will also learn a shorter form of the question phrase, "What are you doing?" read – v. to look at and understand the meaning of letters, words, symbols, etc. What are you doing now? What are your friends doing? Here is an example: "I am reading and my friends are listening to music." Write about it in the Facebook Comments section below. 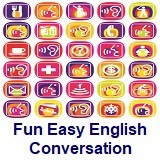 Do the activity and practice writing the activity words. Click lesson activity to get the printable PDF version. The page opens to a new window.